There are plenty of iOS apps that can help protect your privacy when it comes to messaging with friends and family, but that still doesn’t change the fact that you’re also very likely to use the default Messages app in iOS 8, especially because of iMessage. While iMessages are encrypted just like FaceTime calls, there are other things you can do to protect your privacy on the iPhone while using the MEssages app. First, should do with your iPhone to prevent access to all your data is enable Touch ID or passcode security on your device, so that people can’t simply unlock your phone and see your photos, messages and other files. Second, disabling message previews might also be handy to prevent people from reading incoming texts. With message previews on, you’re getting a snippet of the incoming message when a notification arrives. Third, you can disable to improve your privacy is read receipts. You can choose not to tell other people you have read their iMessages by simply disabling read receipts. Interestingly, Apple will supposedly improve the feature in iOS 9 by letting you enable read receipts on a contact-by-contact basis. 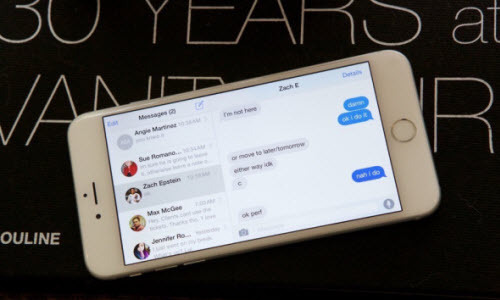 Fourth, you can automatically delete messages from the iPhone, which is a measure that will not only free up space on the handset, but also make sure your messages are gone for good (well, at least after 30 days). Obviously, you can still delete individual messages the moment you receive them if you want. Finally comes to manage messages on other Apple devices you’re signed into. The messages will reach those devices as well, so if you want to wipe them from Macs and iPads, you should do it on a per-device basis, just as you did on the iPhone. How To Selectively Save SMS Messages Text Off iPhone? This entry was posted in iOS 8, iPhone, Messages and tagged iOS 8, iPhone messages tips, make messaging as private as possible, messaging tips by IosdroneD. Bookmark the permalink.